From the past 3 days, I’ve been diligently looking up for recipes to prepare salads for a healthy body. So far, they all turned out to be delicious and filling. Eating Salad for dinner makes me feel lighter and I seemed to sleep quite well. It is all too early to come to conclusions, yet I am very happy about the outcome. 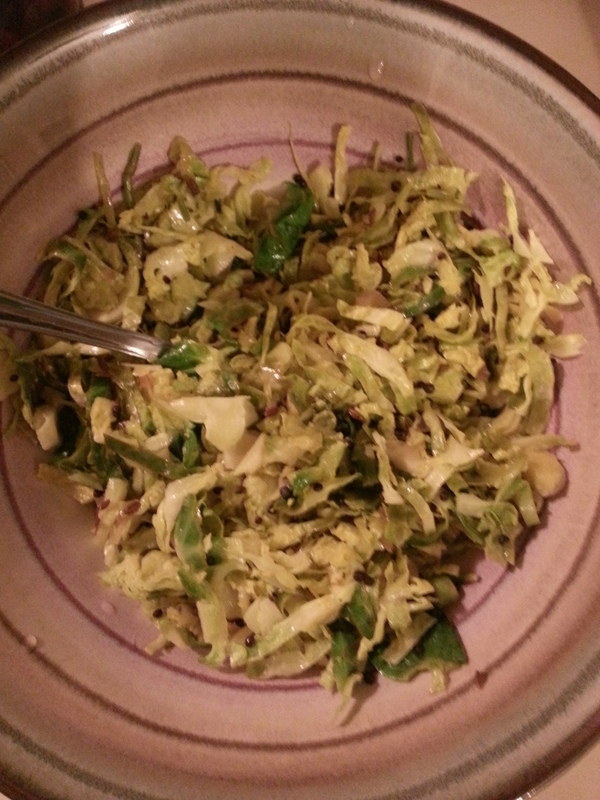 Here is a Salad made out of Brussels Sprouts with Indian touch of spices. It turned out to be an delicious one. I could not resist having it. You could top it with walnuts, raisins, chicken pieces or any of your choice, I topped it with cranberries and few pomegranate seeds. You should try of what I did.. Although I found this recipe online but changed it according to my taste. Brussels Sprouts – cut in half at stem and then make into thin slices horizontally , after you slice them up, add about 2 spoons of lime juice to it and salt for taste. Mustard & cumin seeds – each of one tea spoon full. I guess, I am not very expert in writing recipes or explaining it so well as other’s do. But, this is my first attempt and the salad turned out to be extremely delicious and I could not stop myself from sharing this with you all food lovers or people who love cooking. Let me know what you think about it? or if you tried this – let me know how it tasted.